This customer in Fletcher was still having iron staining with the existing filtration system (not ours) that was in this home when she moved in. She wanted to know what her options were to have this issue corrected. After testing the water we gave her our recommendations, and she chose to replace the old out-dated system completely. 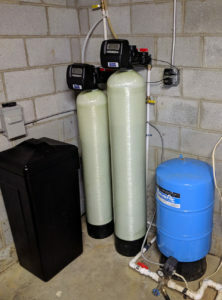 We installed our American Made iron filter to remove the iron, and a water softener to remove the hard water. Very successful upgrade to the filtration system And now she has clean, clear water and very happy!